Soilmec’s CSP System is the most advanced high performing system available, ensuring high production rates. 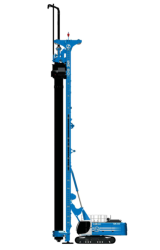 Soilmec Ltd provides a CSP System that is innovative in design, using two independently controlled, counter-rotating rotary heads, ensuring. The lower head drives the casing, fixed to a cutting shoe which cuts concrete away from female piles, and at the same time the upper head drives the auger. After the hole is drilled, concrete is pumped through the hollow auger, while the casing and auger is extracted simultaneously. With the new 8.5m auger extension, the Soilmec System can go deeper giving a maximum drilling depth of 28.6m and a max. cased depth of 20m, making a three-level basement within its capabilities. These results, combined with a maximum 1,200mm diameter, allows Soilmec to be the leader in the CSP technology. In order to ensure safety, the conveying system has been improved and simplified. During drilling the excavated material is loaded onto the flight to be transported to the top of the casing, then through a Spoil Chute to the ground. 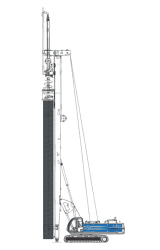 The Spoil Chute is composed of a telescopic column of buckets connected by wire ropes, a winch is used to extend and retract the chute. 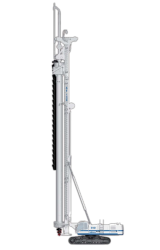 Soilmec have developed a lower double roller auger cleaner that can free wheel as well as being hydraulically operated. The new spoil collecting and conveying system is characterised by simplicity and the fact that it does not hinder the drilling stroke, the maximum the depth afforded by the machine can still be reached. 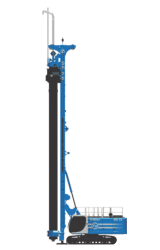 CAP/CSP (Cased Augered / Secant Piles) technology was conceived for lined piles with the continuous flight auger method. A particularly efficient method of building secant piles for the formation of continuous structural and/or sealed bulkheads. 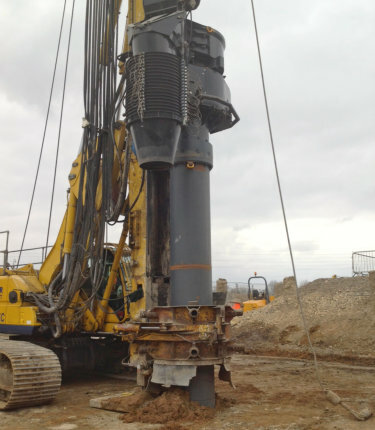 In the operating phases piles are dug with simultaneous driving of the casing and the augers into the soil. When casing is completely driven the pile’s digging may continue only with the blades. Once the digging phase is finished, the blades and lining are extracted; at the same time the concrete is poured through the internal passage in the core of the blades. Once pouring is done, the cage is inserted into the still wet concrete. The continuous diaphragm is constructed with secant primary and secondary piles, properly overlapped; with this application it is necessary to construct guiding walls to ensure correct planimetric positioning of the piles and to guide the lining pipe on the surface. 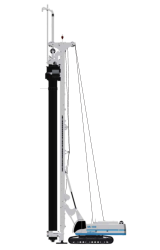 The great performance of the rig is guaranteed thanks to the double independent rotary head that, assisted by crowd-force of the crowd-winch system, assures the best production rate. 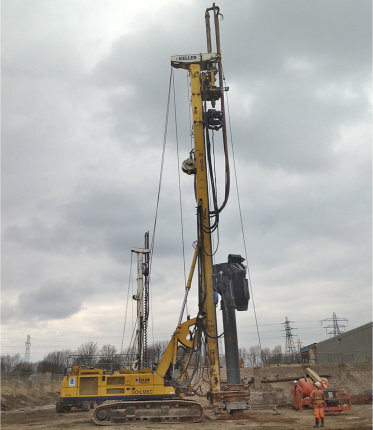 The cased augered/secant piles method can be utilised in a wide range of cohesive and cohesionless soils, with or without the presence of a water-bearing stratum and without bentonite fluid as wall support. The use of a casing allows to overpass concrete existing structures and penetrate rocks. The technology does not produce shocks, vibrations, noise, allowing to work in urban areas. Cased augered/secant piles does not induce disturbances to adjacent structures and it prevents soil decompression. 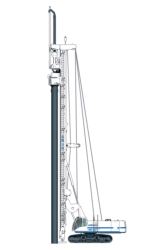 The cased piles grants verticality in the range of 0,5%. 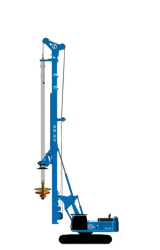 The minimum required equipment (the rig plus the concrete pump) allows to minimise the job site installation plant and to operate in very restricted areas. High industrial production rates can be easily reached. 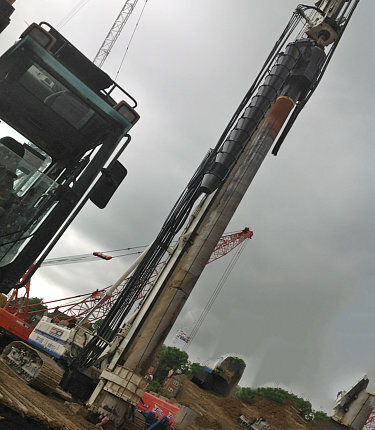 Pile diameter: 800 to 1200 mm. 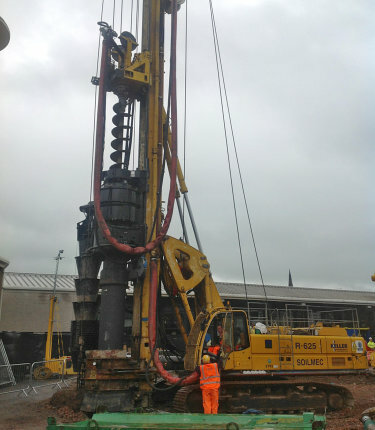 Pile depth: 22.5 to 28 m.
Cased depth: 16 to21 m.